The concept of how to properly adjust a turnbuckle seems to sometimes elude most people. This is understandable as I didn’t used to spend my days thinking about tightening cables, like I do now. So let’s take a moment to discuss how this is done properly. There are generally three different styles of turnbuckles. Yes, there are a few more styles, however these concepts should give you the gist for any turnbuckle. First things first, always make sure that you start by taking out the cotter pins and removing any old tape. Generally, to tighten or loosen turnbuckles it is the reverse of what you have learned your whole life, “righty-tighty, lefty-loosey” is now “lefty-tighty, righty-loosey”. 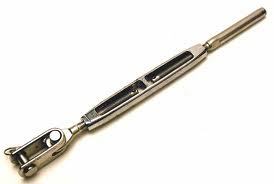 OPEN BODY TURNBUCKLES: The open body style turnbuckle is the most common style in today’s sailboat market and will require either an adjustable wrench and a spike (a ‘beefy’ screw driver should do), or a second adjustable wrench. If you have a turnbuckle that has a swage stud at the top end, then look closely and locate the wrench flat which will be either machined or pressed into the stud by the manufacturer. NOTE: Some boats today still have the old, Closed Body/Tubular Style , stainless steel bottles screw type turnbuckle (these should be replaced ASAP with chrome-bronze bodies). 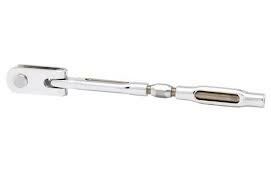 To adjust this type of turnbuckle you can use either and appropriately sized Ice Pick or C Sherman Johnson’s purpose made tool (click link and scroll to bottom of page) to stick in the small hole located in the middle of the body. Vise grips or channel locks are not the answer here. DOUBLE JAWED TURNBUCKLES: You may also have a double jawed turnbuckle which accepts an eye fitting attached to the end of the stay. In this situation it is important to keep the upper jaw/eye end from spinning by using either a spike or screwdriver. Also, please note: these turnbuckles are often installed upside down and not consistently. So figuring out which way is tight and which way is loose can be a doozie and may vary from stay to stay. It may be worth the extra time to make sure they are all configured in the same fashion, matching up with the aforementioned tightening/loosening method (“lefty-tighty, righty-loosey”). MECHANICAL STUDS AND ROD STUDS : It is also possible that your rigging utilizes a mechanical stud at the top end of the turnbuckle. 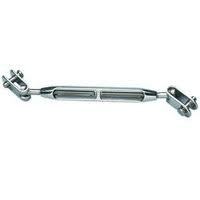 This is a similar product to that used for open body rod turnbuckles, and the same directions should be followed. Be careful in this situation as the mechanical stud will have two wrench flats, one is to tighten the cap of the mechanical stud (this is NOT the one to use and may cause the fitting to become undone!) and one is to hold the stud in place while turning the turnbuckle body. This wrench flat will sometimes be less noticeable, but if you look closely you will be able to determine which ‘flat’ holds the stud and not the cap. TURNBUCKLES THAT UTILIZE RIGGING SCREWS (ROD AND WIRE): Next we have the rigging screw style turnbuckle, typically provided by Navtec. This looks like an open body turnbuckle, but in reverse. Instead of one body and two studs, there are two bodies and one stud. 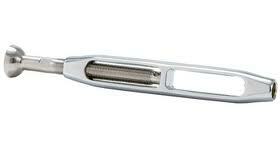 This is another typical turnbuckle found on rod rigged boats and you should follow these same guidelines here as well. Again, care must be taken to ensure that the upper end of the turnbuckle does not spin. In this case it is the upper body portion that will need to be either held in place by an adjustable wrench or a spike. Then use another wrench to turn the rigging screw by using the wrench flats on the screw. When you are done make sure you line up the cotter pin holes in the studs so that the turnbuckle can be pinned. If cotter pins aren’t present then there should be locking nuts of some sort. A turnbuckle ALWAYS needs to be secured so that it cannot become undone. TIP: No matter what type of turnbuckle you are adjusting make sure the wire, rod or whatever type of stay material you may have, does NOT turn, or is in any way able to become distorted. This can lead to shroud failure! All the way closed is a problem because that’s all there is, no more tensioning is available. All the way open is only a problem if they cannot be pinned/ secured. You always need enough thread bury to get the cotter pin in at the least. Another way to think of it, or in the case of the closed body, you are looking to have at least enough threads engaged to fill the entire threaded section of the body (top and bottom) to be save. very informative article, i have already save it, we will test our turnbuckle with your methods, thanks a lot!